This September 21, Join Dunker Punks Across the Country in Praying for Peace. 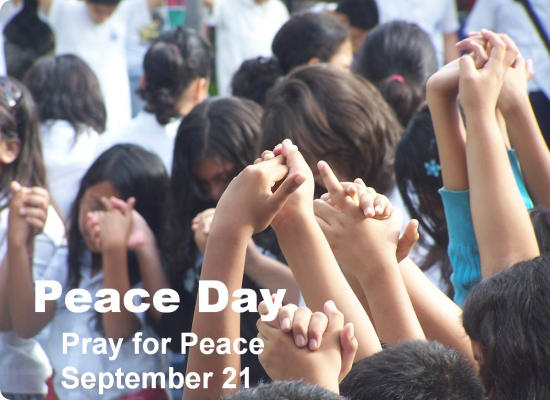 Peace Day Pray is a day of prayer in celebration of the International Day of Peace. Jeez, another day of action devoted to prayer!? It’s almost like praying is one of the most active ways we can express our faith! I challenge you to look at prayer in new ways. Prayer can be a way of seeking inspiration from Jesus. Prayer can be done in community! Prayers can be actions! Actions can be prayerful! Dunker Punks everywhere will be doing their Dunker Punk thing on Peace Day, praying with their fellow Dunker Punks, and doing something to promote peace. As we approach Peace Day, dunkerpunks.com will assemble a few more resources and ideas of how you can get involved. Check out the Peace Day website for some inspiration, and while you’re at it, register to get involved! Join our event on Facebook! Share how you are going to participate, by yourself, with your friends, family, or church community, and then on September 21st go out (or stay in) and do it!